Windows Explorer is the core file browser in Windows. People use it every day for file operations like opening, deleting or editing files. A question came up yesterday in the system wide website shortcuts article, that I would like to address today. Jojo asked if it is possible to open Internet shortcuts with another browser than the default Internet browser when clicking on them. The standard behavior in Windows Explorer links one program, the so called default program, to a file type or folder. It is common knowledge that it is possible to add items to the Windows Explorer context menu, as many programs tend to do that. Think of all the archivers like WinZip or WinRar for instance, they love to add options to the right-click menu. Research did not reveal many applications that would allow the user to add custom items to Windows Explorer. To make things worse, most guides where outdated. Finding Fast Explorer among the noise was pure luck. The free software program is compatible with 32-bit and 64-bit editions of Windows, including Windows Vista and Windows 7. It can be used to add programs to the context menu, and also to remove entries from it if necessary. 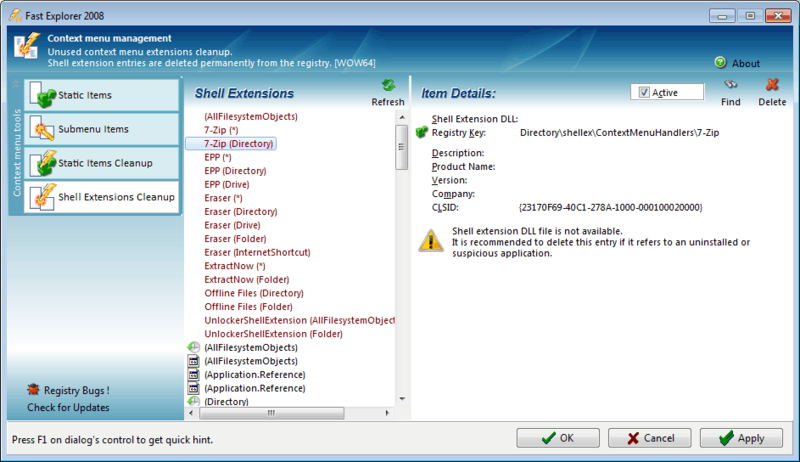 Fast Explorer scans all existing file associations and context menu entries in the Registry on startup, before it displays the program interface. The program offers two main options, that are divided into two items each. The first group is divided into static items and submenu items. This refers to the location of the new entries in the context menu. Static items appear in the root structure, while submenus in a folder structure. Both can be configured to be displayed for specifically selected file types, or for all file types. Let us use yesterday's example to demonstrate how easy it is to create a new entry in the Windows Explorer right-click menu. Jojo wanted the option to launch Internet Explorer favorites with a browser that is not the default browser. In his case, Firefox was the default browser and he wanted to launch them with Internet Explorer. Selecting Static Items in the left menu, and then the Add button allows us to do that. This opens the file browser, to select an application from the system, in this case the Internet Explorer program. Fast Explorer displays the changes in its interface after selection. The right column lists the item details. It is currently configured for all files, which means the new Internet Explorer entry will appear on all file right-clicks in Windows Explorer. Not that useful as it adds to the noise and is usually not needed. A click on File Type opens the file type browser. Locate the Internet Shortcut .url in the list and select it. 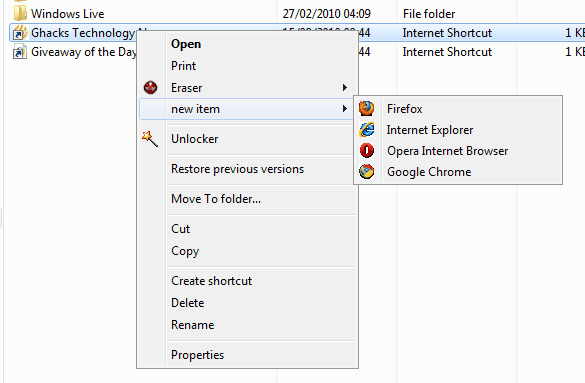 A click on Apply confirms the change, and adds the Internet Explorer entry to the right-click menu in Windows Explorer. The same method applies to the submenu entries, with the difference that you should begin by adding a submenu from the Item menu before adding programs to it. It is also important to note that the selected file association of the core link needs to be identical to the selected file types of the programs added to the program. The core link will set the type automatically to All Files by default. This has to side effects. It first adds to the clutter in the context menu, as the new options are displayed for every file type. It second means that it may not appear for the selected file association of the program. This is for instance the case if you select All Files, and the program to be linked to Internet shortcuts. Adding new programs to the Windows Explorer menu, can be beneficial for many different work scenarios. Think of software developers who want to open source code in a development suite, but sometimes also in Notepad or another program that can process the source files, or photographers who process their files in different programs. The custom items can be removed at any time from the program. Changes are immediately visible in Windows Explorer. The second group offered by the program offers to cleanup entries that have been added by other programs. 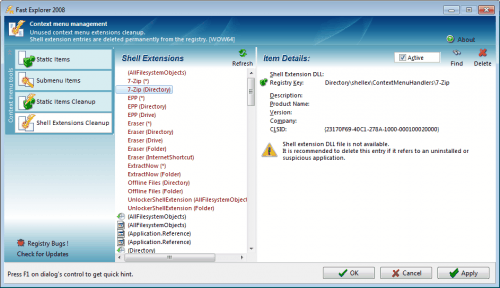 Especially the Shell Extensions Cleanup menu can be helpful in removing invalid or unnecessary items from the right-click menu in Windows Explorer. Fast Explorer displays a list of invalid entries at the top of the list. Those are leftovers from previous installations, and can usually be removed without side effects. But deleting is only one choice. It is furthermore possible to locate the right dynamic link library in Windows to fix the entry. Fast Explorer 2008 is an excellent program for Windows users who want more control over the Windows Explorer context menu. The developer website is still available, the program downloads on the other hand not. We have taken the liberty to add the files to our server so that everyone can download them easily. Now if Microsoft would only begin to add this functionality to Windows. Fingers crossed that they expand the options in Windows 8. Thanks for the excellent article, Martin. It contained a lot of good knowledge, which could be quite useful in Windows 8. C:\Users\me\AppData\Local\Temp\ZVuxQPL4.exe.part could not be saved, because the source file could not be read. Try right-clicking the file and selecting Save As. Save it to your download directory. I just checked the download and it works for me. Did you try and run the program right after download using the browser?